Finding time to read as a working parent with a young child at home is not always easy. There is dinner to prepare, laundry to do, sons and daughters who want our attention, maybe work to think about for your day job, lunches to pack, crafts to make, emails to answer, and you constantly feel like you should be doing all of the things. And then when 8pm rolls around and (fingers crossed) the littles are asleep, you fall on the couch with a glass of wine and watch Netflix. I do this too. We are all so busy. But I am also passionate about reading, and I love taking in a good book. Here is how I squeeze in reading time. Sebastian is old enough that I don't need to go in the pool with him for his swimming lessons anymore, so I love swimming lesson time because I'm guaranteed 25 minutes of reading time. This isn't easy. I am often lost in the vortex of my phone during downtime. I'm working at putting my phone down more to capture these moments for myself. So, whether it's swimming, soccer, basketball, or hockey, bring your book along and, after their practise has started, let yourself get a chapter in. I always try and read a bit before bed. If nothing else, that's usually a guaranteed time when it's quiet, I don't have much to do (or, more likely, I have no energy left to do all of the things). I'm not a stay up all night and read until the end type reader, but I will read until 11 or 11:30 if I'm especially captivated by the plot of a book. And on the rare occasions I'm awake before Sebastian in the morning, I'll just stay put in bed and read a few pages. The alternative of actually waking up and doing things in the house is just way too risky. One creak on the floor near his room, and it's game over. I'll just stay in bed with my book. When Sebastian was younger, I used to try and read during nap time. 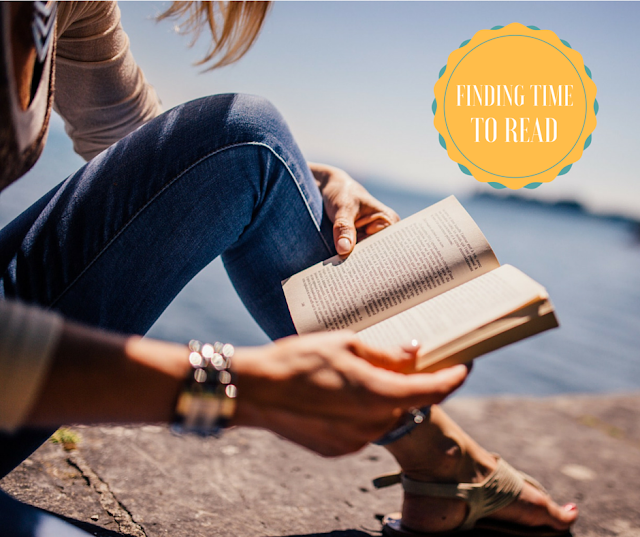 I'd aim to give myself at least 30 - 45 minutes of pause from the craziness of the day and give myself that time to read, even if there were dishes to do and laundry to fold. It wasn't easy, and I had to force myself to take this break. Now that Sebastian doesn't nap, I still need that afternoon break, so I try to encourage him to play with his books (I Spy readers that he can do himself are perfect for this, as are the Highlights Hidden Picture magazines). And, if I'm being totally honest, sometimes it's not books or magazines or puzzles. Sometimes it's the iPad. And I'm working on letting go of my guilt about that. Let's not be too hard on ourselves. Our children don't need us in their face every waking moment of the day. It's ok to encourage them to play independently, if for no other reason than Mommy needs a break. Sebastian loves sitting on our front porch, so sometimes he's doing his magazines and books and sometimes he's playing games on the iPad, and sometimes he's watching Octonauts. So in the summer when I'm not working, for an hour or so each afternoon, he does that while I read. The other thing that is actually great about this is that Sebastian sees me reading. If I only read before bed, he wouldn't get to see me read, and it is important that our children watch us continue to be passionate about books and learning as adults. If we want our children to be readers, modelling this habit is essential. Sebastian will ask me questions about my book (he always wants to know who the villain is) and will ask me to "read one line" out loud to him. It's one thing to see a bookshelf full of "grown up books" in the house. It's quite another thing completely to see an adult actively reading those books. Next time you go on vacation, plan some downtime. I try to do this whenever we go somewhere. I love planning all of the fun things we're going to do wherever we are, but I always make sure there is also a healthy dose of downtime. This is made much easier if you travel with grandparents or aunts and uncles because they're delighted to entertain the little ones, but it's ok to have a couple shots of #3 from this list incorporated into your family vacation. Everyone gets a rest and is ready for more fun afterwards! Bonus points if you can plan a weekend away with your partner or a friend sans children. That would give you the most time to read! When you're motivated to achieve a goal, you will find time to complete it. I've heard of so many different types of reading goals. Mine this year is ambitious. I'm doing the 50 Book Pledge and trying to read 50 books this year. Last year I worked on Book Riot's Read Harder Challenge. There are only 24 books on that list, so it's more manageable. And I love the reading challenge my friend Nicole set for herself this year. Her goal for each quarter is to read one book for professional or personal growth and one book for pleasure. Toni Morrison once wrote of her experience as a writer and single mother of two young boys, that she found the time to write "in the edges of the day." I think the same could be said for reading. I almost always have a book on me because I never know when I'm going to be able to steal away a few extra moments, a few extra pages. It's not even about reading a large quantity of books that is important. Find time to fall in love with any book and simply enjoy the story.